Jack Goff has produced one of the best performances of his Dunlop MSA British Touring Car Championship career so far by taking pole position in both qualifying sessions at Snetterton, following up his earlier effort with a monumental lap record in the ballast-free encounter that sets the grid for tomorrow’s landmark ‘Diamond Double’ race. The WIX Racing with Eurotech star has been in fine form throughout the day, topping FP2 before taking pole in the opening qualifying session, but it was his breathtaking display in today’s special celebratory qualifying session that will live long in the memory. Championship leader Colin Turkington was the first to set a benchmark lap but the timing screens were soon lit up during the frenetic 15-minutes of running. 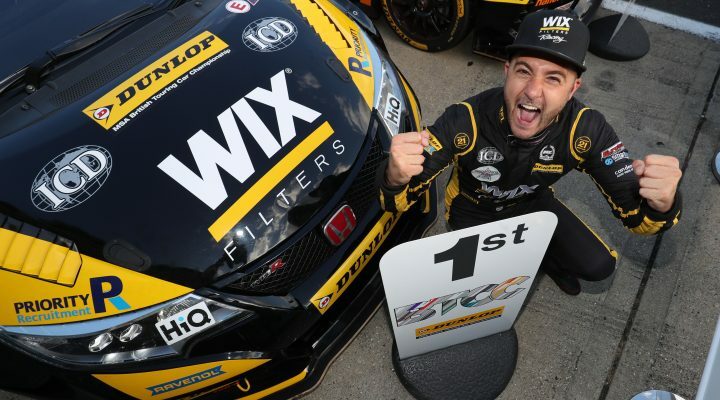 When the dust settled, quite literally around the scorching 2.99-mile Norfolk circuit, it was Goff’s lap time of 1:55.171s that would clinch one of the most prized pole positions in the illustrious 60-year history of the BTCC. Matt Neal – a three-time champion and a man whose career has spanned across three of those BTCC decades – showed that he still has so much to offer as the most experienced man on the grid took second. Team Shredded Wheat Racing with Gallagher driver Tom Chilton was another joyous character in the pitlane post-session after he grabbed an all-important tow from the Honda of Dan Cammish to secure third on the grid. Speedworks Motorsport’s Tom Ingram pipped Cammish for fourth, whilst Pirtek-backed Andrew Jordan was the first BMW home in sixth. Mac Tools with Ciceley Motorsport’s Adam Morgan bounced back to form with seventh, whilst Team BMW’s Turkington had to settle for eighth at the finish. Young guns Brett Smith and Tom Oliphant rounded out the top ten.